Steffon Armitage's hopes of playing for France at next year's World Cup appear remote after the International Rugby Board clarified its eligibility rules. 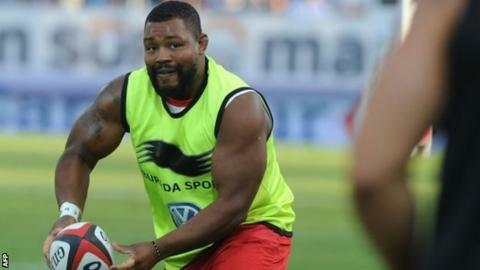 The Toulon flanker, who has five England caps, is one of the most high-profile players trying to use Olympic regulations to change nationality. Armitage, 28, was recently named in an enlarged 74-man France squad. Participation in various Sevens events, a passport for his new country and IRB approval are also needed. The IRB, rugby's world governing body, has now ruled that participation in four Sevens World Series legs, or in two of the four legs of next summer's Fira-AER Sevens European Grand Prix, is required to fulfil part of the criteria. It appears unlikely - albeit not impossible - that Armitage will be able to play in the required number of Sevens World Series tournaments, many of which will clash with his club commitments with Toulon. However, the IRB only wants players with legitimate Sevens intentions to attempt to switch nationality, and the Regulations Committee could reject a case if it felt the player had not demonstrated a "genuine, close, credible and established national link" with the new country. Armitage has been at Toulon since 2011 and last season was named European player of the year after helping his club win the Heineken Cup and French league title. However, he has not played for England since he came on as a substitute in a 17-12 win over Italy in 2010 because Rugby Football Union rules state that players playing for clubs overseas will only be selected in extraordinary circumstances.